After an early drive from home, I parked the car at the Crawford Hostel and went in to check the weather. It was mostly sunny and about 15 degrees. The forecast was for 40 degrees in the valleys, but I don’t think it ever got over 20 on the summit. 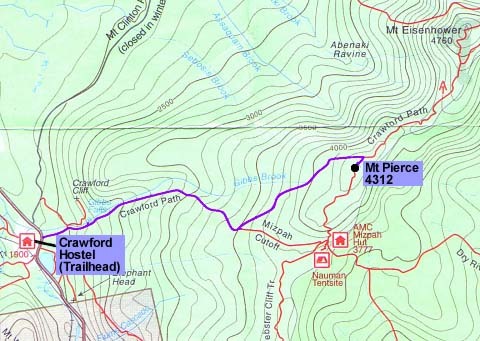 I walked across Rt 302 to the start of the Crawford Path. 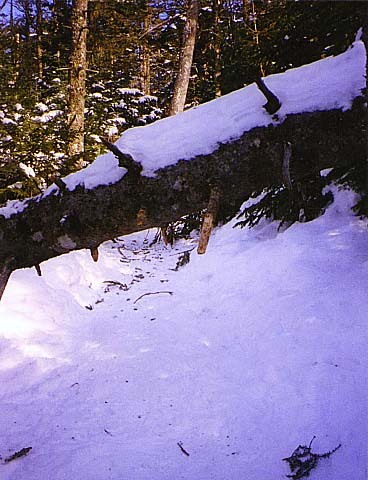 The normally shoulder-high trail sign was noticeably lower from the deep snow. The trail itself was covered with packed snow over ice. 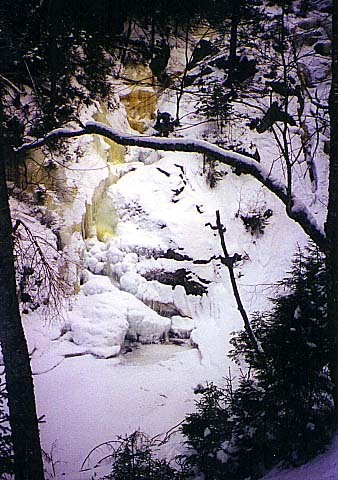 I started up the trail, stopping to look at Gibb’s Falls which were frozen solid, and mostly covered over with snow. The hiking was slow because my pack was too heavy, but the footing was easy. I didn't have any trouble with postholing unless I stepped way off trail. Even then, the ice crust underneath the fresh snow supported my weight to some extent. I stopped at the junction with the Mizpah Cutoff for a short rest. Even though it was cold, I was sweating a lot and had to open my coat and take off my hat and gloves while hiking, then put them on again when I stopped for a while. A short distance beyond the Mizpah Cutoff junction, I met two hikers who were on their way down. They were the first people I’d seen on the trail all morning. They said they had been camping on the side of Mt Eisenhower the night before. On the upper third of the trail, I had to crawl under a few downed trees. The trail was nice though, and the trees looked pretty in the snow. 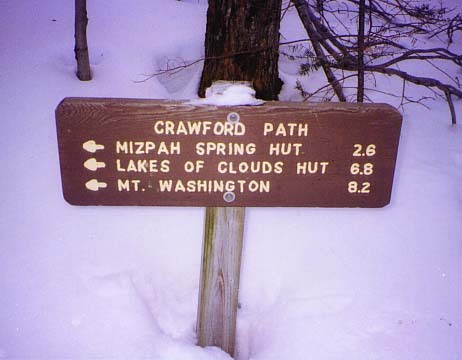 The Crawford Path Trailhead. This sign normally stands at shoulder height, but was now barely a foot above the snow. 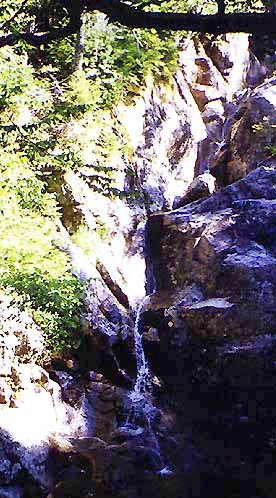 Gibb's Falls. I imagine these falls look pretty in the summer, but they weren't very impressive at the moment as they were frozen hard and obscured under a layer of fresh snow. Downed tree above the Mizpah Cutoff junction. I had to crawl under a few of these, but had no real problems.